Buckingham’s 1st December Christmas Light Switch and Christmas Market set to be a fabulous affair! This year’s Christmas Light Switch on will be particularly festive, with the much anticipated pop-up artificial ice rink setting the scene from 26th November. Afternoon and evening skating slots are available during the week as well as all day skating from 11am to 9pm on the weekend of 1st and 2nd December. Click below to book your tickets before they sell out. On Saturday 1st December a Christmas Market will take over the Cattlepens area of Buckingham Town Centre and around the ice rink – the market will take place from 11am until 8pm. A selection of Christmas goodies will be available including tasty hot food and drink offerings as well as a child sized ride. 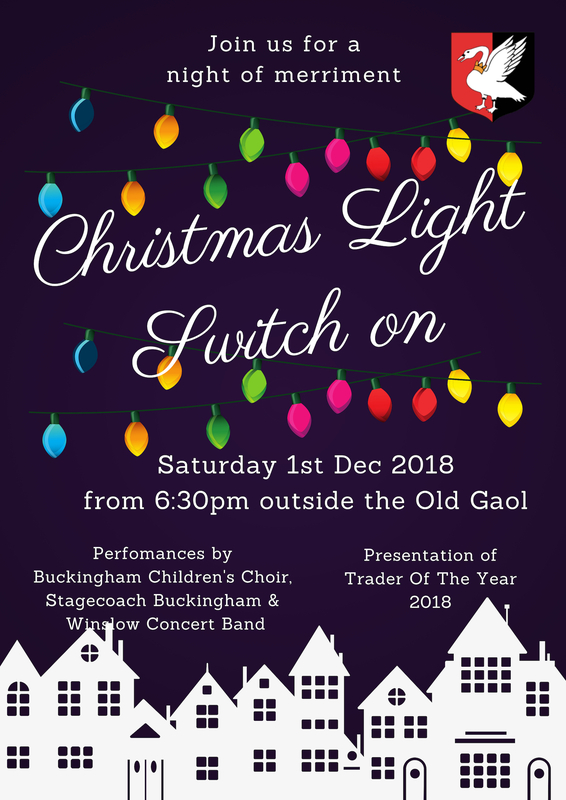 In the evening, please gather alongside the Old Gaol for the Light Switch On itself. This will begin at 6.30pm with a welcome from the Mayor, Councillor Jon Harvey and the Town Crier, Russell Cross. We’re also expecting a visit of extra special guests from MK Lightning Ice Hockey Team as well as Santa!